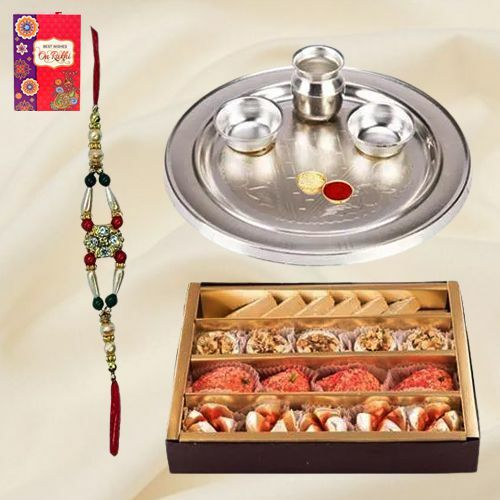 Convey your wishes to your brother or dear ones on Raksha Bandhan by ordering this Tasty Assortment of Sweets with Silver Plated Aarti Thali which comes with a fabulous Rakhi, Roli Tilak and Chawal free of cost. A delicious assortment of 250 gr. Badam Katli, Kaju Pista Roll, Dry Fruits Chakki and Kaju Barfi from Haldiram along with 52 gm. Silver plated Paan shaped Aarti Thali add more sweetness into the relationship.